Hello fellow Lab Rats! 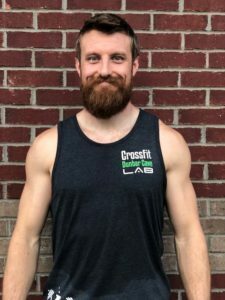 My name is Garrik, and I began my CrossFit journey as most “bros” do, unsatisfied with endless cycles of “chest-days” and curls, and began training in CrossFit in 2015. It quickly satisfied my desire for intense workouts, creative programming, and having a unique group of people to enjoy it all with. I’ve genuinely enjoyed training with the athletes of Dunbar Cave Lab ever since! “Who Dares, Wins” is my favorite motto, and it spearheads my passion to live at my best, and to help others live at theirs. The culture of CrossFit, and undoubtedly of DCL, has grown to one focused on helping people achieve goals, become physically better, and socially interdependent, and that is what I strive to facilitate.